At the Star Wars Celebration in Chicago on Saturday, a new official single player game was unveiled. Star Wars Jedi: Fallen Order, from EA and Respawn, will be released on PC, PlayStation 4, and Xbox One on 15th November 2019. 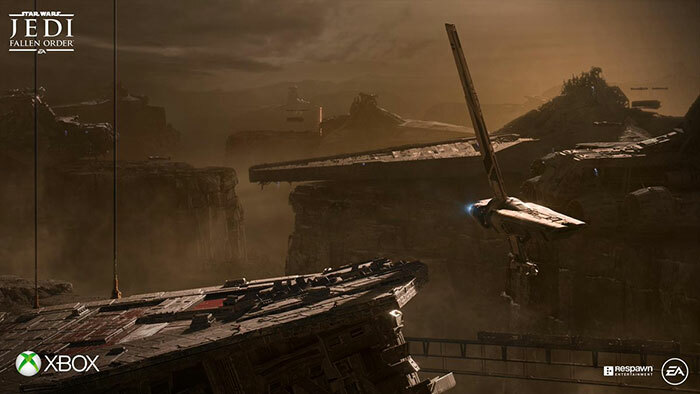 The reveal trailer, including in-game footage, is embedded below. Star Wars Jedi: Fallen Order is set after Star Wars: Episode III — Revenge of the Sith. In the game you will play as Cal Kestis—one of the last surviving members of the Jedi Order after the purge of Order 66. As the game begins Cal is living 'under the radar' on Padawan. Star Wars Jedi: Fallen Order is an action melee adventure game and in the game you will use Force powers and Light Sabre skills to avoid being captured and exterminated by the Empire. EA's reveal trailer shows so called Purge Troopers who are seeking out the remnants of the Jedi, after any indicative reports from Empire planets. Once a Jedi has been identified the Troopers call on deadly Inquisitors to eliminate them. Thus, in the reveal trailer we hear Cal Kestis say that, as a Jedi in hiding one must not reach within, nor stand out, but one must accept the past, and trust no one but the Force. 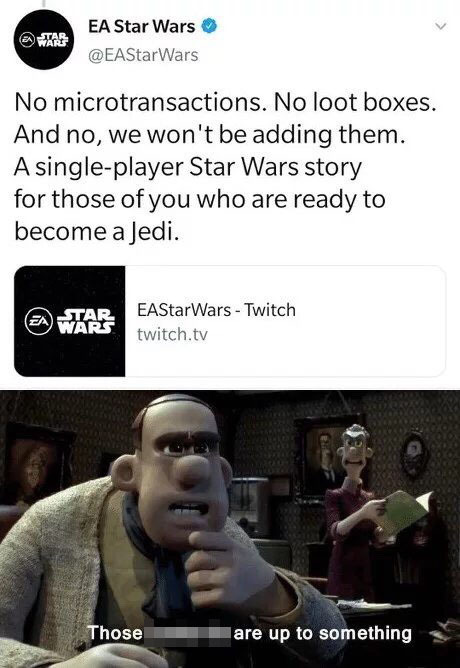 As the reveal trailer was shared, EA took to Twitter to promise that this new single player Star Wars story for those wishing to play a Jedi would include "No microtransactions. No loot boxes. And no, we won't be adding them." Star Wars fans on Twitter were rather suspicious of EA's assertions, as you will see if you click the Tweet link and scroll down. EA is looking for pre-orders already. You can pre-order on for PC, PS4 or Xbox One right now. I clicked on the PC option and was offered the Deluxe Edition download for £59.99. You can save £5 for opting for the Standard Edition. 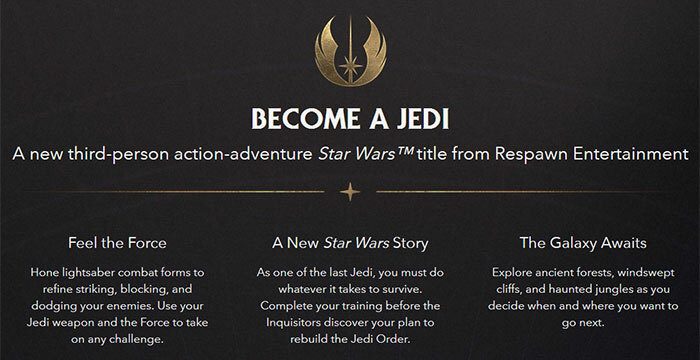 Get the story behind the game with the Star Wars: Jedi Fallen Order Deluxe Edition featuring a 'Director's Cut' suite of behind-the-scenes features and content as well as additional unique cosmetic equipment for your adventure. Pre-order the Deluxe Edition to also receive all of the pre-order bonus content. Pre-order Star Wars: Jedi Fallen Order to outfit yourself with unique cosmetic equipment for your lightsaber and droid companion. If it's not micro transactions it'll be a half game with the rest purchased via DLC's. Money grabbers don't change that easy, there's always a catch! EA promises are like farts - they smell bad, yet are nice compared to what follows them. Didn't Disney revoke their license?